It is now officially the end of the summer and we have been reflecting on the last few months. We have had a busy summer over here at River Valley Construction. We have had the pleasure to work on a wide variety projects for some great customers. We have been keeping busy building new decks, fence installs, finishing basements, laying concrete patios a kitchen renovation and even a bath remodel. What follows are a few Facebook Posts featuring samples of our recent work. We get this question asked often. Its not an easy question to ask mainly because it deals with what you as the home owner perceives as a honest budget and what the desired look you are going for. First I would like to point out if your deck is over 10 years of age you might want to consider replacing the entire deck do to a few major issues. 2. Building practices change and updated codes may require new safety measures. 3. New deck materials can offer and extended life to a new deck. I do however realize that there are many of us that live in a budget strapped world and would like to potential save the deck they have or possibly just keep the substructure. I can certainly understand and have been there myself. The truth is the main structure of the deck is about a quarter of the total labor and material cost. 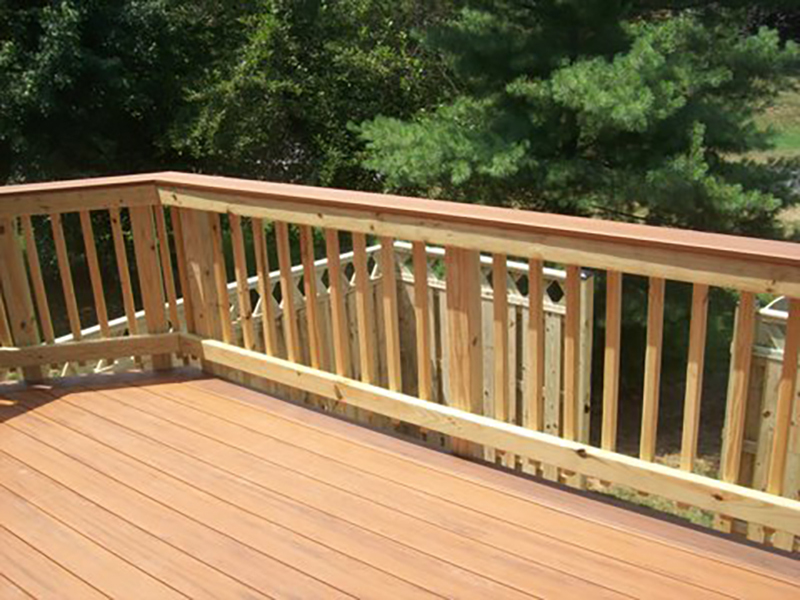 Majority of the deck cost are in the decking products themselves and the railing. I always advise a good inspection of the existing structure to be evaluated by a qualified installer before you reuse the substructure. If its cost saving your going for, I suggest looking at the decking and railing products and make sure your main structure is sound. Hey Folks……. Now that 2013 is upon us, it’s a good idea to start planning any home renovations that you want done in the early spring. There are many different reasons to renovate a home, but remodeling tips that allow a home to appear larger are among the most important. Changing the amount of space in a home is difficult, but rearranging space within a home is much more affordable. It is also sometimes possible to make a room more efficient and therefore seem larger or to use lighting and other minor changes to give the appearance of more space. Compliments on your remodeling efforts are always a welcome payoff, but nothing beats seeing your home value rise as a result of your hard work. It can be tricky to determine which home improvement projects are worth the sweat and which aren’t. To gain the most from your improvements, select projects that do more with what you already have. Focus on affordable beauty- While everyone wants a beautiful kitchen, the days of professional-grade kitchens went bye-bye when home equity loans became tougher to get! You can get still a great look without spending an arm and a leg. Tile and Backsplashes upgrades are in- Formal mosaic tile is on the way out, taking its place are glass/stone/tile mosaic composites creating backsplashes in contemporary settings. Cool Color Palette- 2013 will find mild and smooth color everywhere as it blends the right amount of chocolate, grey and a touch of green. Living In Your Home Longer- a growing trend to help aging baby boomers safely “grow old” in their homes, for as long as possible utilizing certified aging-in-place specialists (CAPS). Watch for easy kitchen and bath upgrades to enhance functionality, comfort and safety based on Universal Design. Healthy Home, Happy Living-Green and sustainable design is here to stay. The number one trend for 2013 will be to create a healthy living environment, free of toxins and harsh chemicals. More and more upgrade trends include the use of low VOC materials to improve indoor air quality, testing combustion safety, and radon mitigation. The single most important remodeling tips that everyone should follow is to develop a realistic budget and stick to it. Budget problems during remodeling can be disastrous, often derailing progress and creating undesirable results. Individual rooms may benefit from different remodeling strategies, and there are many tips available for specific areas of a home. Overall, planning ahead is the key to a successful remodeling project no matter what the scale or design. … That’s the real trend of 2013! What is your home remodeling project for 2013?We can help! Molding and trim make an Impact from baseboards to crown molding, these details add width, depth and height to a boring room. One of the primary characteristics distinguishing a attractive room from a basic box is the attention to molding. In the cheapest construction, moldings will be minimal and undersized. One of the easiest ways to upgrade a room is to beef up all the moldings, adding width, depth and height to the trim. Far from closing in a room, the increased framing adds depth to the walls, especially if it is painted the same color as the walls for a unified look. Interior moldings provide attitude as well as architectural interest. Weaver’s Top list of Ideas to Consider! When adding custom trim, crown moulding tends to get the most response when people enter a room. We can work with you to design crown moulding that is right for you. Crown moulding can enhance many details in a home including walls, cabinets, bookcases, and built-in cabinets. Ceilings can be treated with custom trim, mouldings, and beams. Coffered ceilings are created with beams and mouldings in a geometric shape to define an area. Coffered ceilings can define a room to set it apart from other rooms even if there are no walls to define the area. They can give a room a formal look but can also be used in a family room to break up an expansive ceiling. A tray ceiling added to a room with a low ceiling will give a perception of more height or grandness. Ceilings can also be enhanced with the addition of beams. River Valley Construction will work with you to determine the best type of ceiling for your space. With a strong background in home renovations , River Valley Construction can work with you to design a moulding scheme that complements and revitalize your home. Our highly skilled team of professional tradesmen can satisfy all your needs. Each project is covered by general liability insurance. All projects are supervised by owner every day. How Can We Help? Contact us today for a free in home consultation! See you soon. Remodeling your basement will not only provide your friends and family with a great new space, it will also considerably increase your home’s market value. No matter if you are looking to add a bathroom to your basement or considering doing a complete basement overhaul the helpful contractors will be able to help you regardless of your project size. We are often asked: What is a general price for a finished basement space? We find on average a finished basement can be between $20-$30 a square foot as a turnkey package. This is largely influenced by the finishes requested. We also encourage our homeowners to consider some of the remodeling they might want to tackle on their own with our DIY “Assist” Program.To get started, call today for a free in home consultation. A finished basement is a great addition to a home. Most people think a basement remodel is one of the easiest home remodeling projects to complete. More often than not, it is actually one of the more complex projects. Basements often have water and drainage problems, inadequate ceiling heights, old sloping concrete floor slabs, no insulation, and no easy way to connect the plumbing. And most people expect the basement to serve many purposes. Often the basement is designed to accommodate work and play, media rooms, storage and craft areas and many other uses. So unless you are looking for a simple, one-room remodel, be prepared to address a number of challenges. Before you do any kind of finished work on a basement, make sure there won’t be any water issues that could cause damage. Go outside and inspect the exterior walls for moisture problems. Make sure the ground is sloped away from the foundation walls. Also, check the downspouts, if they’re clogged, it could be create a lot of moisture and bring it into the basement. Once you have a design plan and you’ve checked for moisture, the next thing you should do is find out whether you need to get a permit for the proposed renovation. Also, make sure that everything pertaining to electrical work is done to code. If you need to have access to electrical and plumbing systems in your ceiling, suspended ceiling tiles are the way to go. Otherwise, with a drywall ceiling, you’d have to create access panels. Baseboard heating is an excellent choice for a basement. Normally the basement is the coolest room in the house, so choose a heating method wisely. If a room will be used for sleeping be sure it has an egress window to the exterior. It’s not safe to sleep in a room with only one exit. Recessed lighting is great for basements since you don’t want fixtures hanging from a low ceiling. Because there’s limited natural light, basement lighting is essential to brighten up the place.